Natuzzi Editions Tullio has the latest design style ethos with tall thin arms, which combines superb looks with the practicality of a smaller dimension. 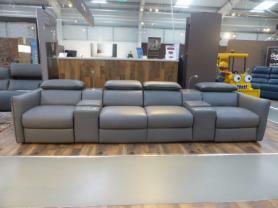 Again modular with powered mid seats and joining arms with cupholders and storage. Now introducing a brand-new touch to control LED reading light. Tullio Sofas IN STOCK and ready to deliver!